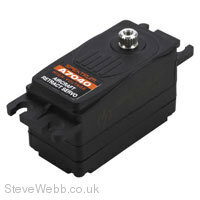 The A7040 is a HV compatible fully proportional servo. For those looking for a retract servo that can be powered by a 2S battery, without the need for a voltage regulator the A7040 now provides that option. Its low profile design makes the A7040 an ideal fit for pilots with larger aircraft looking for a solid mechanical retract system. It’s fully proportional design allows for end point adjustment and speed adjustment to allow for scale-like gear movement.